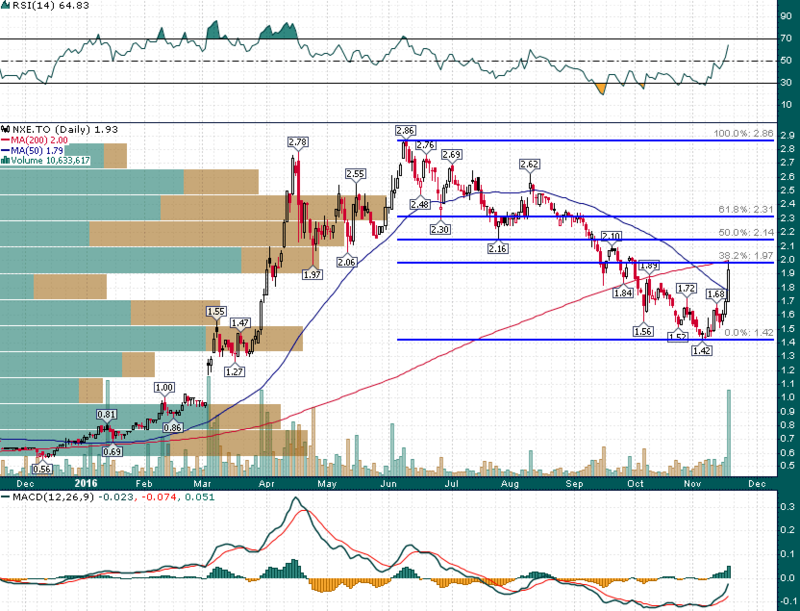 How The CEO.CA Stream Nailed A 20%+ Move in NexGen Energy | Energy and Gold Ltd.
After peaking in early June $NXE began drifting lower eventually suffering a major break of technical support in September. When the technical picture began to deteriorate considerably I made it no secret I was not a fan of holding a long position in NXE with posts here and here. 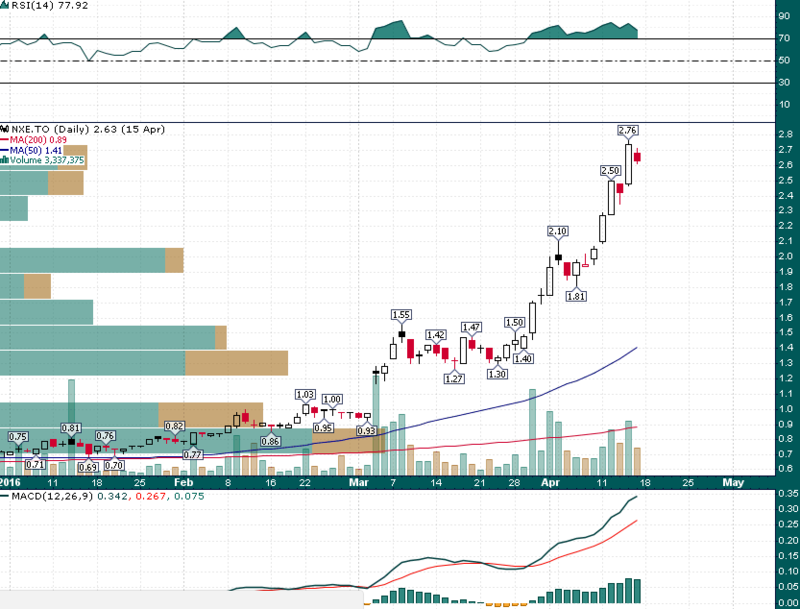 On October 28th @Ty shared a couple of nice charts confirming that he also saw a bottom brewing. @ylr began to make a series of posts in which he identified the tide turning to the upside and accumulated a long position in real time on the stream. 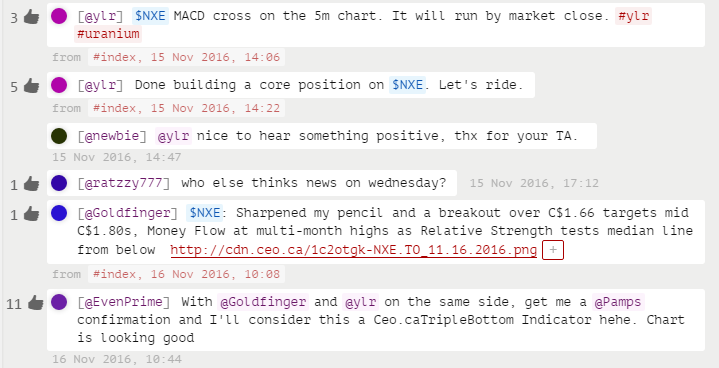 @BDMinefinder also indicated that he was accumulating $NXE shares and not being shy about it. The man is correct of course; when we get to know different chat commentators we can add context to their posts. The fact that myself, @PamplonaTrader, @ylr, @highroi and many other experienced traders from the stream were on the same side of $NXE and seeing a uniquely bullish setup added a lot of weight. A positive sort of confirmation bias if you will. The rally temporarily paused at the 38.2% Fibonacci retracement of the June-November decline, however, a much bigger level exists up at ~C$2.15 which represents previous support and the 50% retrace of the entire decline. My 20% return was just a short term trade. CEO.CA is equally indispensable for long term investors. It was the first publication to write about NexGen’s discovery in 2014 when shares were under 40 cents. CEO.CA was the first web site to publish a site visit report, and it was a bullish one. When NexGen’s Arrow discovery got real the company’s largest investor, as well as the former chief engineer at Canada’s largest uranium miner, shared their bullish views on NexGen with CEO.CA readers. No other publication came close in profit generating coverage. It’s not an exaggeration to say that CEO.CA has nailed NexGen every step of the way including during the stock’s painful summer correction. I have been a regular CEO.CA chat user for more than a year and I can honestly state that the value of the stream has increased exponentially in the last few months. I use it for hours a day and I have actually come to prefer CEO.CA to my Twitter stream, today’s value added and timely $NXE chats only serves to further confirm this. DISCLAIMER: The work included in this article is based on current events, technical charts, and the author’s opinions. It may contain errors, and you shouldn’t make any investment decision based solely on what you read here. This publication contains forward-looking statements, including but not limited to comments regarding predictions and projections. The author was long NXE shares at the time of writing. Forward-looking statements address future events and conditions and therefore involve inherent risks and uncertainties. Actual results may differ materially from those currently anticipated in such statements. The views expressed in this publication and on the EnergyandGold website do not necessarily reflect the views of Energy and Gold Publishing LTD, publisher of EnergyandGold.com. This publication is provided for informational and entertainment purposes only and is not a recommendation to buy or sell any security. Always thoroughly do your own due diligence and talk to a licensed investment adviser prior to making any investment decisions. Junior resource companies can easily lose 100% of their value so read company profiles on www.SEDAR.com for important risk disclosures. It’s your money and your responsibility.